It was a pleasure to meet you last night! And your presentation was great! The people who filled out evaluation forms ranked you as “excellent!” Your enthusiasm for your subject is contagious and all the personal examples you use and your suggestions are practical, everyday things we can do! And I was so pleased to see all of the participants joining in and sharing their ideas! I love it when a speaker can engage the audience in such a way. Your program was delightful! I have already heard some great compliments on how people enjoyed your program. 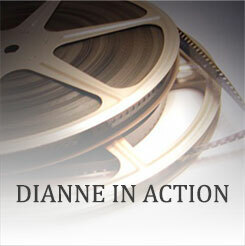 I would highly recommend Dianne Morr as a speaker for your group. She effectively communicated simple ways to put a smile on your face…She provided our group of counselors with strategies to build on simple indulgences each day. Our counselors will use her techniques with students in small groups and continue the pursuit of stopping worry in its tracks. Dianne gave a great presentation filled with clear easy pointers for bringing more happiness into our lives. She was perfect for our Bartlett Women’s Club. Dianne Morr’s “Moms Make Happy Happen” presentation was a fantastic finale to our MOPS year. Dianne addressed several hot topics through helpful tips and funny anecdotes regarding stress, carving out personal time as moms, and finding enough hours in the day to get everything done and still sleep. What a delight! Thank you so much for the presentation last night. The residents truly enjoyed you and your ideas. One commented as she was leaving “great topic and great presenter” and another said “the ideas were presented in such a new way that I just want to go and start writing everything down now.” I appreciate your coming out and making a difference for our residents. I really enjoyed the interaction between the speaker and the group tonight. ~ Kim C.
I enjoyed hearing about small indulgences. I am going to actively look to do this. I also enjoyed hearing about positive psychology and prayer. I will try to write one positive thing each day. Continue this excellent presentation on happiness. We need more happiness in the world.